The thrip is a tiny pest commonly found in a greenhouse.They can be almost any color, have wings, and move very quickly. 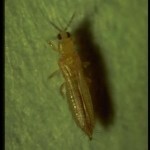 Individual thrips can be hard to see, but detection is not difficult with care. This little guys will travel in herds, and work together to rip tiny strips from the tops of the leaves of the plant to get at the juice underneath. Because of the loss of chlorophyll the leaves become brittle, can look dark, and will probably crumble. Look for their waste dropping which will appear as tiny black lines present across leaf surface. Due to their ability to fly, they can infest your garden very quickly. The worst issue is that the trhip loves the buds best! Sometimes you can see them swarm when you shake the bud, but be aware that you are forcing them to fly to the next plant by doing so! 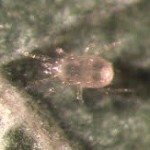 Not only is cucumeris the best beneficial to control most species of thrips but also Broad Mites and Hemp Russet Mites. Cucumeris are available as adults in a 1 liter (50,000) bottle (release 25 -50 per sq foot) or a Slow Release packet. 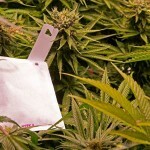 This small packet is designed to hang in the crop. It has a balanced population of A. cucumeris in addition to the food mite Tyrophagus. When protected from sunlight and excessive moisture, the packet will release cucumeris every day for up to 6 weeks, usually yielding about 5,000 cucumeris. Hang 1 packet per plant or 10 sq feet. This product was originally developed in England for use in the Hybrid Cucumbers because they do not produce pollen. Their lifespan is 10 days as an immature and 30 days as an adult. For best results use in conjunction with Stratiolaelaps.